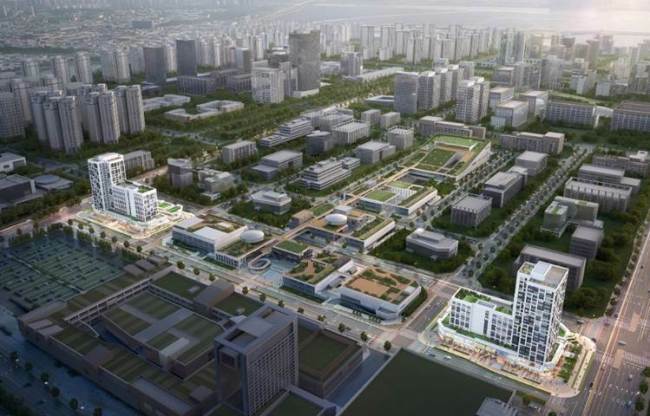 Posco Engineering and Construction is seeking tenants to fill the studio apartments and store spaces of the Songdo The Sharp Triple Tower apartment complex set to be built in Songdo, Incheon. The Songdo The Sharp Triple Tower consists of two buildings with three underground floors and 23 above-ground floors. The first two floors are available to store owners. And as of now, only parts of the first floor are available to prospective tenants. From the third floor up, the building houses studio apartments, or officetels. There are 710 studios, between 21 and 59 square meters in size. Some of the 50 square-meter apartments include terraces. The one-room studios are equipped with sliding doors to accommodate different lifestyles. The larger residential studios are more spacious, Posco said. The apartments also feature cutting-edge technology, including a smart-control system that allows tenants to control the heating and gas meters via Kakao’s voice-recognition system. Location is another major convenience of the Songdo The Sharp Triple Tower. It sits within walking distance of Technopark Station on Incheon’s Subway Line No. 1, adjacent to a number of major shopping complexes.